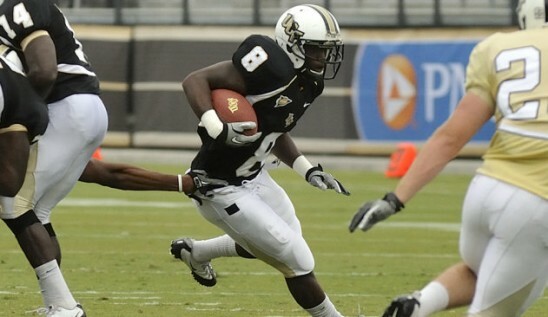 There aren’t many football players in the entire country that are easier to root for than UCF’s Storm Johnson. His story has been well documented, so I tried to stick to football in this interview. Tom: First of all Storm, thank you for your time, I really appreciate the chance to talk with you more in depth and I know you’re busy. Tom: What was it like sitting out at UCF last season? Storm: I felt like it was probably one of the hardest things I had to do in my life. I could still practice and everything, but sitting out in a sport that I really love and not being able to go out and compete against other schools with my teammates was extremely hard. Tom: What made you choose UCF? Storm: Coach O’Leary recruited me out of high school and I kept good ties with him. I loved the program and it was somewhere I felt comfortable at and somewhere I felt I could play at. Tom: Your coaches really seemed to be excited to get you on the field even when you weren’t eligible last season. How do you think spring ball went for you? Storm: I felt I accomplished a lot in spring ball, we got a lot of chemistry and I feel that spring ball gave us an edge on this upcoming camp and it gave us the goals that we needed to set for ourselves and gave us a clear shot at accomplishing our goals. Storm: 5’11”, 215, and the last time I got clocked as a freshman weighing at about 218 I ran a 4.37. Tom: I’ve read a number of articles about your upbringing and how hard you worked. Do you think your experiences growing up have made you a better football player? Storm: I feel like I have. My parents did a lot for me and showed me how to work hard for the things you want to get and that you gotta work hard for everything you really wanna get. Tom: What was your #1 goal of the spring practices with Central Florida? Storm: Just trying to get playing time. My #1 goal is to have a great practice every practice, never take a down for granted, and always do 110% and get in my playbook. I know the playbook inside and out and I studied it like a subject in school. Tom: Do you expect to start this season? Storm: That’s a really good question I have no answer for. I just go hard in practice every day and push the running backs. We all push each other every practice so we can get better as a unit, but that’s all I can really say about that question. Tom: Are you looking forward to that first game? Who do you guys play? Storm: Akron, and yes. I’ve been looking forward to that day for a very long time. Storm: For the team it’s to win every game. For myself, not really. This is my first college season where I can be a regular contributor so I’m just trying to help my team however I can. Tom: If you had a great season personally, would you consider declaring for the NFL Draft? Storm: Honestly I just want to have a great season and we will worry about that when the time comes. Tom: Did your offensive coaches mention anything to you about things you were doing well during spring ball? Storm: Yeah they did. Just having great instincts, figuring the play out as it develops, bursting through the hole, little things like that. They were more concerned with things I was doing wrong than what I was doing right. They praised me when I got things right though, but as a team we want to focus on things we need to work on obviously. Tom: What do you think your greatest strength is as a football player? Tom: What about some of the things you think you need to work on? Storm: I feel like my game is never going to be perfect, there’s always something to work on to get better. For me, I want to work on blocking, catching. Tom: Do you feel comfortable in pass protection right now? Storm: I mean yeah. I think the first thing is just not being scared to make contact with the person, that’s half the thing right there. The other part is just technique, and I’d say I’m about 85% to where I want to be with that. Tom: Do you have any mentors for the running back position? People you’ve patterned your game after? Storm: I’ve watched a lot of running backs, but I’ve watched a lot of Reggie Bush’s film from college. Storm: There’s a lot of talent on our defense, there’s a lot of talent on the whole unit. I mean, they all make plays. It’s hard to say. Storm: Yeah of course. The running backs push eachother so when one of us makes a play the others try to step it up and make plays. We’ve got a lot of depth at the running back position. Tom: You’re getting some hype coming into the season, do you feel any added pressure because of the transfer and some of the rising expectations? Storm: Nah, I just believe in my coaches, believe in my teammates and I just want to go out and play football like I’ve been playing. I’m not thinking about any hype or any of that, just focusing on executing and helping my team win. Storm: I feel like every game I’m looking forward to, me personally I’m looking forward to my first game in my first actual season. Any time I can put that helmet on I’m looking forward to it. Storm: *Laughs* Wow… one thing… I wanna say I feel like I study a lot in school, at the library, and I always get my homework done before it’s due. I feel like I enjoy doing schoolwork a lot more than people think. Tom: That is definitely the first time I’ve ever gotten that answer to that question, I love that. Well thank you for taking the time to talk with me and I am looking forward to watching you this season! I’m sure we’ll talk before the season, good luck with the rest of your training. When does summer camp start for you? Tom: Less than a month away! I’m ready for some football and I know you are too, thank you for your time Storm, and good luck with the rest of your training. I remember watching this kid on youtube before he got to the U and then also during his freshmen year thinking he had a chance to be special. Now I don’t know why he really left the U. Tom any chance you asked him off the record why he left Miami. I mean if he is talking about all the depth at running back and making each other better he would have stayed at the U to compete with Lamar Miller and Javaris James last year. When looking at his physical abilities Storm can compete no question at the next level but I am interested to see how mentally he handles adversity when put on the spot by NFL executives. My opinion he was used to being handed things and getting away with it because of his abilities that will never happen in the NFL especially with a running back. It was smart for Storm to choose UCF for his transfer location. He undoubtedly will get more playing time, more carries, better exposure and more of a chance to see the NFL if this is the path he chooses. UCF has put out some of the best NFL talent including Asante Samuel, Brandon Marshall, Mike Sims-Walker to name a few. UCF’s running back core is one of the best in the country, consistently. Teams on UCF’s schedule better “hunker down” for the Storm! UCF is a quality school but as far as producing NFL talent its laughable compared to Maimi not just the guys from the Championship years look at the draft in recent years you will find a bunch of Maimi guys all over the NFL. Storm would be the number 1 back this year at the U had he stayed. The best back to come out of UCF was Kevin Smith and he still wasnt picked until round 3 take Kevin Smith put those numbers in a Maimi Uniform and he is a 1st round back.